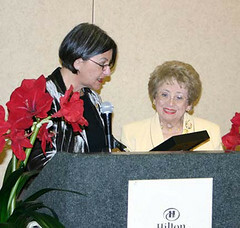 Esther Schuster, past president of Birmingham Hadassah, reads a letter of congratulations to Birmingham's Marian Radwin from national Hadassah president June Walker. Radwin was honored on Feb. 5 at the Southern Branch of Hadassah regional board meeting, for her years of service to the organization. A past chapter president and regional officer, Radwin chairs Life Membership in Birmingham, and an astounding 80 percent of the chapter's 1150 members are Life Members.